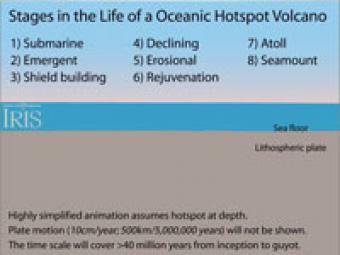 What is a volcanic hotspot? A volcanic "hotspot" is an area in the mantle from which heat rises as a thermal plume from deep in the Earth. High heat and lower pressure at the base of the lithosphere (tectonic plate) facilitates melting of the rock. This melt, called magma, rises through cracks and erupts to form volcanoes. As the tectonic plate moves over the stationary hot spot, the volcanoes are rafted away and new ones form in their place. This results in chains of volcanoes, such as the Hawaiian Islands. 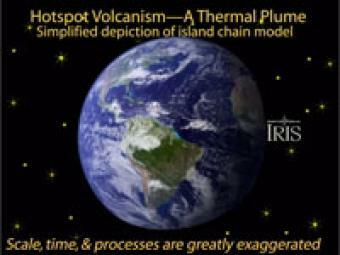 This animation shows the evolution of a single island in a hotspot chain as it forms and evolves over a period of about 40 million years. 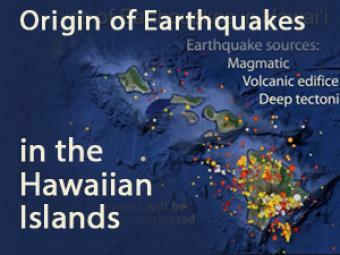 Thousands of earthquakes are recorded in the Hawaiian Islands every year. Most occur in and beneath the Big Island. What causes these earthquakes? This animation offers three general sources for the earthquakes.